Therapy dog or Service dog? It’s hot. July in central Florida hot, and I am scrunched under a breezeless tent in the only patch of shade available. My dog, Mac, pants at my feet, nearly shoulder to shoulder with about ten other dog/owner teams waiting to take the Therapy dog test. The heat and hassle is worth it. 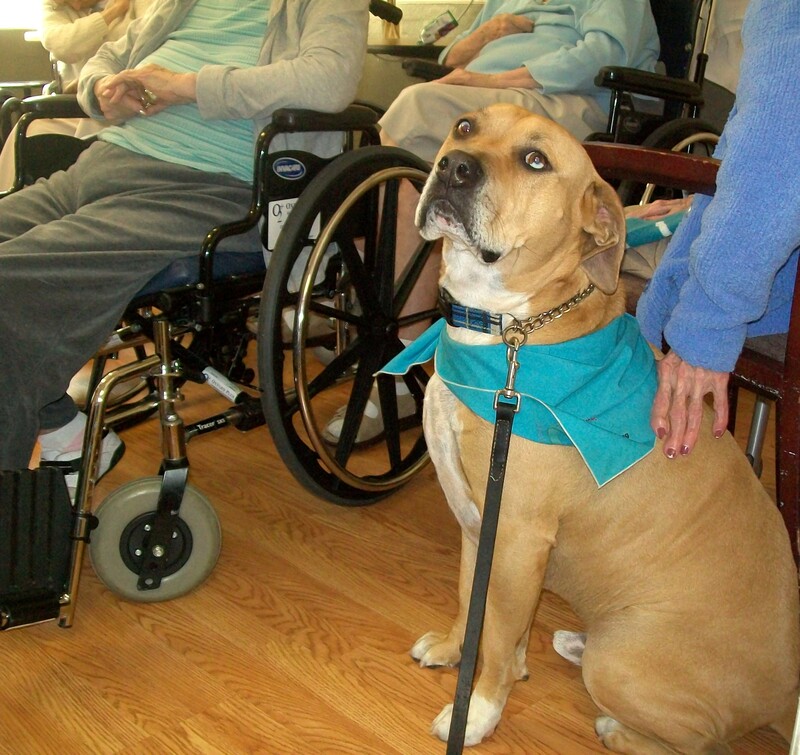 Therapy dogs offer comfort and companionship to those in need, from bereft disaster victims post-911 to nursing home or hospice residents. The job description for these love machines on four legs has widened considerably. Therapy dogs now act as a calming presence for victims in courtrooms, with armed forces veterans suffering from post-traumatic stress syndrome, and as non-judgemental friends to at-risk children. It’s finally our turn. The evaluator, an older man, is sweating, and I can’t help but worry about his sunburned neck. Mac runs through his obedience commands with ease if not haste (the heat is oppressive) and aces the test. When the time comes for me to ‘leave’ him for three minutes to check his stress level, Mac sensibly lies down in the shadow of the assistant holding his leash. I am thrilled at our accomplishment. Mac was a Humane Society dog that was not in demand. I was his only inquiry the entire three months he was there, but he is mine and perfect. And now I am beyond proud of him. Even though the job of Therapy dog is not physically stressful, Mac is exhausted after a round of petting from heavily veined and papery hands at the nursing home where we go with two other dog/owner teams. He rests his broad head in the laps of wheelchair-bound old folks and sighs heavily. This delights everyone, but I know Mac is absorbing some of their need; taking it off their thin shoulders and onto his own. I became an evaluator for TDI, (Therapy Dogs International) after a lengthy interview and test process, in order to help other dog/owner teams share the love. I am often asked if this means dogs can ride on planes with you, and be allowed into stores and such, and I have to bring up Service dogs. A Service dog, which is, by law, allowed to accompany the owner virtually anywhere, performs a service, act or assistance to someone who cannot do it themselves. Service dogs are seeing eye dogs, hearing assistance dogs, epileptic seizure detection dogs, and the like. These are the dogs you will see on planes and in grocery stores, not Therapy dogs. Therapy is a volunteer calling; a wonderful reaching out to share all the happiness your dog brings you with others in need. The picture tells the story. Mac was made for this, but he needed manners and obedience skills to do it. Maybe your dog wants this job, too. After all, it involves lots of petting and attention! I'm a certified dog trainer and on-camera spokesperson. Television appearances include news stories on NBC, ABC, and WGN both live and taped stories about dogs and their welfare, plus appearances on 'The Balancing Act' and 'Designing Spaces', both on Lifetime TV. My DVD for kids and dogs, entitled 'Drool School' won a Parents' Choice Foundation Award. I am D.A.R.T. certified by the Humane Society of the United States for disaster animal response, and I travelled to the Gulf Coast to help with pet rescue after Hurricane Katrina. 1 Response to Therapy dog or Service dog? Mac is a dear and it seems like he takes his work very seriously. What a wonderful companion and helper to others!